HIS BOOK ‘My Family And Other Animals‘ is one of the best-loved in the English language, a classic describing the hilarious antics of his siblings as they enjoyed a four-year sojourn on the Greek island of Corfu. But it was from Bournemouth that zoo-keeper, naturalist and author Gerald Durrell first set out on his life’s adventures, after his eldest brother, Lawrence, demand the family quit the ‘sharp, stinging drizzle’ and ‘froth-chained sea’ one grim August day in 1935. And it was to this town, and the Daily Echo‘s offices, that his widow, Lee, returned on Friday with Gerald’s nephew, Gerry Breeze, to research her husband’s links to the area for a new exhibition about him to be unveiled at his wildlife conservation trust and zoo in Jersey. Lee and Gerry Breeze were especially interested in old Daily Echo news cuttings which detailed Gerald’s attempts to get the town of Bournemouth, and then Poole, to allow him to open a zoo. “He was all set to go with Upton House but it fell through,” said Lee. The cuttings reveal how strong the Durrell family connection is to Bournemouth; they returned to the town after their Greek adventure and later his sister, Margo, opened a boarding house in Charminster’s St Alban’s Avenue which was where Gerald kept his animal collection in the garage and where he wrote his best-seller in six weeks, sitting on one of the beds. He also kept a small menagerie in the basement of the J J Allen department store and was in the Echo again when a number of his monkeys escaped, some making it as far away as The Crescent in Boscombe. Posted on October 25, 2012 by Joanna Paraszczuk. 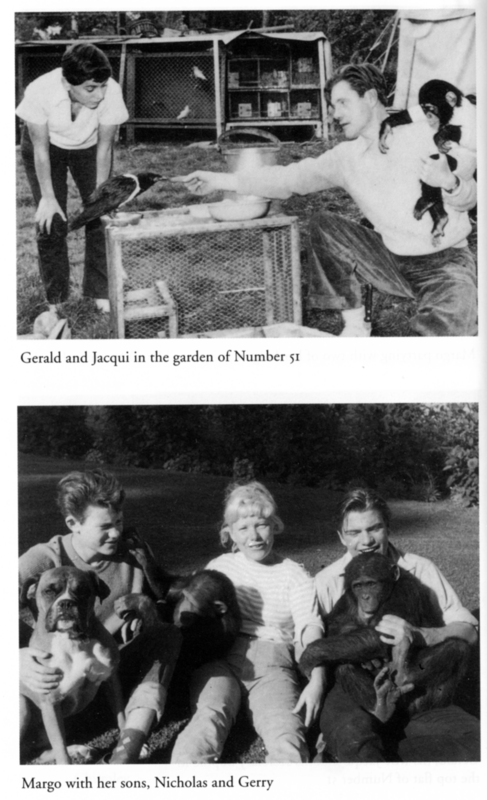 This entry was posted in gerald durrell, Memoirs, My Family and Other Animals and tagged Bournemouth, Charminster, Corfu, Gerald, Gerald Durrell, Jersey, Lee McGeorge Durrell, My Family and Other Animals. Bookmark the permalink.